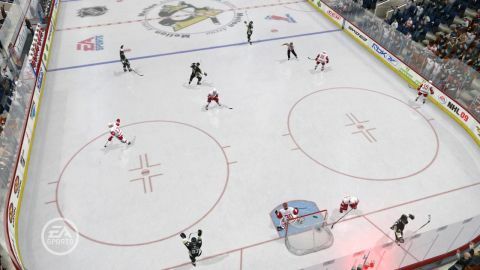 That new system has been tweaked further to allow for easier shooting and the ability to stave off defenders by giving them the old stiff-arm in the face as you power towards the helpless goalie. Consequently a typical match rarely ends at 0-0 anymore, and it’s a much more exciting prospect for those of us who just want something pucking fast, violent and packed with goals. Fights kick off all the time, and commentators talk of a deathly hush descending on the crowd when a home player gets his arse handed to him in front of his fans. The glossy TV-style presentation is suitably glitzy, with shots of players psyching themselves up as they prepare to skate out and get their faces punched off. And you can put yourself right in the middle of it all, to a certain extent, with this year’s major new feature – the FIFA-alike ‘Be a Pro’ mode. You design a custom player, or adopt one of the existing stars from the National Hockey League and beyond, then take him into the big time in your chosen position. Rather than control every player, you have to show the discipline of a real sportsman, and hold your place in the formation while the computer takes care of the rest of the team. Arrows show where you’re supposed to be skating, and you’re graded on how well you played your role. You even have to get subbed and watch from the bench during line changes. This mode is also playable online, with other players teaming up for entire seasons of six-on-six league matches. Sounds like a fine idea, although we’re not sure what mileage you’ll get out of it. It’ll either be the best thing ever or a complete and utter organizational nightmare. Also new – the option to play certain songs from your hard drive as your theme tune, or to celebrate a goal. And you can even upload video clips and screenshots to the EA servers, with some cheap Achievement points available for testing this feature out. Finally, you can always reject the in-depth controls and switch to an old fashioned two-button cheat-o-scheme that, while completely unfair in multiplayer, proves NHL 09 always puts fun before pedantry. Description As ol' Red Green says, "try to keep your stick on the ice," in another year of cold adventures in puckery.